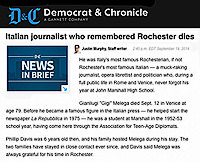 Gianluigi Melega was an ATAD student from Italy and attended John Marshall High SChool in Rochester in 1953. He became a prominent investigative journalist in Italy. “Gigi” passed away on September 12, 2014, at the age of 79. His 1,200 page memoir, Tempo Lungo, contains many fond memories of his experiences in Rochester.